Staircase structures are most frequently associated with a strongly destabilizing vertical gradient of salinity (caused by the confluence of fresh- and saline-water masses). These features have been observed northeast of South America in the tropical Atlantic Ocean just outside the Caribbean Sea, and also in the eastern Atlantic Ocean outside the Mediterranean Sea. Before the dynamics of thermohaline staircases were understood, these features were sometimes dismissed as malfunctions in the oceanographic sensors that recorded them. Research is not conclusive as to what effect these staircase features might have on underwater acoustic propagation. Chin-Bing et al. (1994) studied the effects of thermohaline staircases on low-frequency (50 Hz) sound propagation. Several propagation models were used to generate transmission loss as a function of range from source to receiver based on a sound-speed profile containing staircase features. A source was placed (in depth) at the center of the staircase features while receivers were placed above, below and at the center of the features. These results were then compared to baseline (control) simulations based on a profile in which the effects of the staircase features were effectively averaged out. The greatest effects were observed when both the source and the receiver were placed at the center of the features. These effects were attributed to a redistribution of intensity caused by the staircase features. Chin-Bing etal. (1994) also noted that backscatter can occur when the step-structured discontinuities of the thermohaline staircase are on the order of an acoustic wavelength. Thus, at frequencies greater than about 3 kHz, backscatter from the thermohaline steps could become significant. Marine organisms can be segregated into four major categories: plankton, nekton, benthos and algae. Plankton (or floaters) include both plants (phytoplankton) and animals (zooplankton). The zooplankton have little or no swimming ability and thus drift with the currents. Phytoplankton are typically smaller than 0.5 mm while zooplankton are smaller than 1 cm. Nekton (or free swimmers) are animals that are capable of swimming purposefully. Nekton include fish and mammals and occur over the entire depth range of the ocean. Benthos are dwellers on, in or near the bottom of the ocean. Fouling organisms such as barnacles would also be included in this category. Algae include marine plant life, such as seaweed. Biological organisms can affect underwater sound through noise production, attenuation and scattering of signals, presentation of false targets and fouling of sonar transducers. Certain marine animals, many of which are found over the continental shelves, produce sounds that increase the background noise levels. These include snapping shrimp, whales, porpoises and various fish such as croakers and drum fish. Organisms that may cause attenuation are schools of fish, dense populations of plankton and floating kelp, for example. False targets are commonly presented to active sonars by whales or large schools of fish or porpoises. While fouling organisms such as barnacles do not directly affect sound, indirectly they can degrade sonar performance by fouling sonar domes and transducer faces. Furthermore, such organisms can contribute to an increase in hull noise of ships and submarines through the generation of turbulence as the vessels move through the water. This effect is also referred to as self noise, as distinguished from ambient noise. 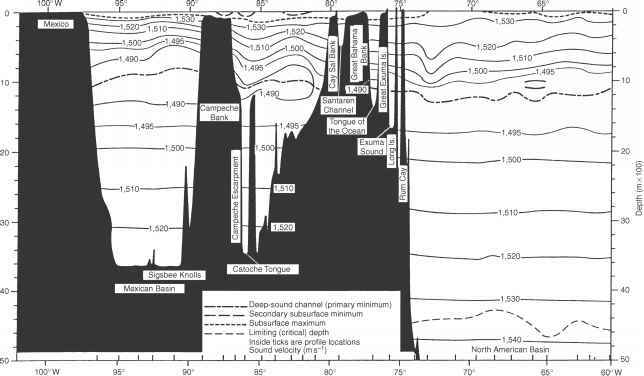 Perhaps the most notable impact of marine organisms on active sonars (particularly those operating at frequencies near 10 kHz) is known as the deep scattering layer (DSL). The DSL is a dense accumulation of marine organisms at depth below the sea surface. The strong scattering nature of the DSL is attributed primarily to fish and other marine animals with swim bladders and gas floats, although plankton and nekton are also present. The DSL is typically encountered in temperate regions. Moreover, the DSL exhibits a diurnal migration in depth, being shallower at night and deeper during the day. The DSL will be further discussed in Chapter 8 (Section 8.2.1).